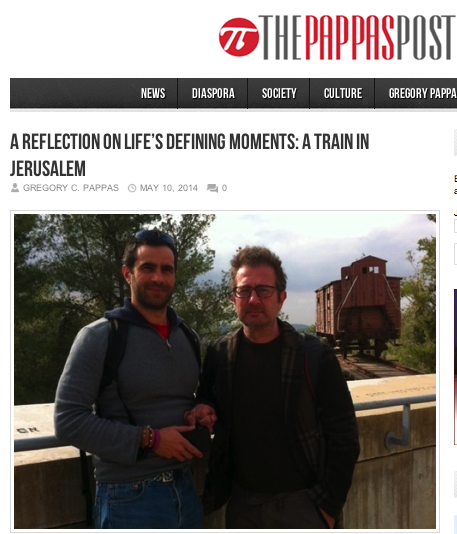 "A REFLECTION OF LIFE'S DEFINING MOMENTS: A TRAIN IN JERUSALEM" published on The Pappas Post website May 10, 2014. In December of this past year I visited Tel Aviv and Jerusalem to do research for a film project I'm producing called "No Man is an Island" about the survival of Nazi-occupied Europe's only Jewish community to survive unscathed, without a single loss. This miraculous event took place on the Greek Island of Zakynthos in 1943-44, when Hitler's "Final Solution" was in full swing and entire communities were wiped out one at a time.
. . . And the journey began. We traveled to Zakynthos, Athens and throughout Israel, meeting survivors, interviewing them and spending countless hours in front of archives and books gathering information that would help in the creation of the script.